...the photographs and block geomodels bring [the subject] to life in a new and fresh way. ... Many important engineering implications are illustrated emphasising the necessity of understanding the geological processes that form the ground profile. ...this book will provide an invaluable insight into the art of unravelling the complexities of the ground. The book provides a valuable systematic guide to the evaluation and understanding of worldwide ground and environmental conditions of sites and their surrounds. This is done through a series of annotated block models and supporting photographs of common geological and geomorphological situations around the world, with basic text explanations and information on each principal block diagram and its annotated photographs. Ground conditions depend on the climatic, geological and geomorphological history of the site and its surrounding area. In ground investigation, ground engineering, design and construction, a preliminary study of the local environment (including climate), the landforms and the geomorphological processes creating and modifying the local landscape is thus required, as well as informed detailed knowledge of the soils and geology, their distribution, properties and engineering behaviour. Geomodels in Engineering Geology outlines the world’s climatic and morphological zones and the changes such environments bring upon the ground. 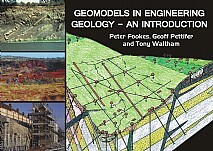 It deals with fundamental aspects of surface soils and geology in relation to their engineering behaviour and guides the way that ground investigation can be developed to provide appropriate information needed for design and construction of a project – augmented by case histories and experience of practical problems. Part 1: The Underlying Factors – Climate and Geology. Part 2: Near-surface Ground Changes. Part 3: Some Basic Geological Environments for Engineering. Part 4: Ground investigation (GI). Part 5: Case Histories and Some Basic Ground Characteristics and Properties. Appendix: Geotechnical Problems Associated with Different Types of Engineering Soils. References. The book will provide instant access to a store of information for engineering geologists, geotechnical/ground engineers whether as an aide mémoire for experienced professionals in a new or novel location, or as a basic guide for those learning about or starting in the profession.